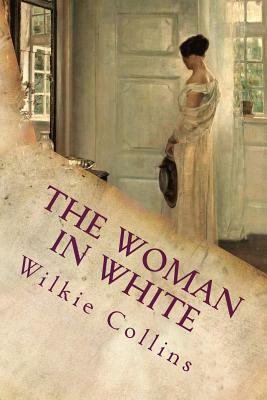 The Woman in White is an epistolary novel written by Wilkie Collins in 1859, serialized in 1859-1860, and first published in book form in 1860. It is considered to be among the first mystery novels. The various strands of the plot combine to produce a thrilling story, leading this particular type of fiction to be described as 'sensation'. A strong theme in the novel is that of marriage and its impact on women (in particular on Laura Fairlie). The plot revolves around men stealing women's identities. The Woman in White was the key book in establishing what became known as 'sensation fiction': breathless and deviously plotted novels that combined domestic Realism, the simple moral universe of theatre melodrama (virtuous women menaced by dastardly cads), and the thirst for gruesome and spectacular crimes that an ever-increasing newspaper readership lapped up with a mix of moral outrage and prurience. Sensation fiction thus fused the Gothic romance with the Realist novel, finding horrors not in some fantastical Medieval castle, but behind the doors of apparently normal suburban semi-detached houses, where secrets festered and multiplied. The story is sometimes considered an early example of detective fiction with protagonist Walter Hartright employing many of the sleuthing techniques of later private detectives. William Wilkie Collins (1824-1889) was an English novelist, playwright, and short story writer. His best-known works are The Woman in White (1859), No Name (1862), Armadale (1866) and The Moonstone (1868). The last is considered the first modern English detective novel. Born into the family of painter William Collins in London, he lived with his family in Italy and France as a child and learned French and Italian. He worked as a clerk for a tea merchant. After his first novel, Antonina, was published in 1850, he met Charles Dickens, who became a close friend, mentor and collaborator. Some of Collins's works were first published in Dickens' journals All the Year Round and Household Words and the two collaborated on drama and fiction.